The shuttering of New York's Chinatown Fair back in March marked the end of an era for the city -- a last vestige of a time when social gaming meant more than just logging on to Xbox Live. The arcade experience hasn't completely disappeared form the metropolitan map, however -- in recent years, a new crop of venues have remixed the concept of yesterday's arcades, places like Brooklyn's Barcade, a shrine to 80s gaming machines that does brisk business serving spirits to Williamsburg's 21 and up crowd. Launched in Ridgewood, Queens by game developers Kunal Gupta and Syed Salahuddin, Babycastles takes the re-invention a step further, offering up something between an arcade space and an art gallery. Babycastles serves as a rare opportunity for independent game developers to showcase their projects in a public, playable forum. The team describes the vision thusly on its Kickstarter page, "the primary goal of Babycastles is to establish independently developed video games as a viable form of social culture for New York City and its youth." 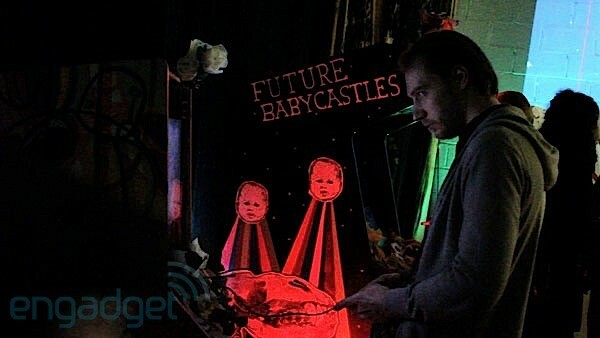 Earlier this month, we caught up with Gupta and Salahuddin for the grand opening of Future Babycastles, a new music venue / arcade located across the street from Brooklyn's historic Domino Sugar factory, in a rapidly gentrifying area of Williamsburg. The duo celebrated the launch in style, with a set from local indie rock darlings Vivian Girls, a DJ, and some homemade deep-fried chicken -- it was a magical synthesis between divergent art forms that share little more than a DIY spirit and (in some cases) a zip code. 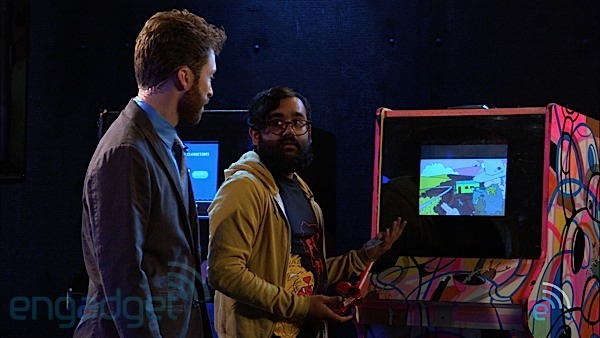 As those in attendance at either the grand opening and the live taping of this month's Engadget Show can tell you, the games themselves are both thematically and stylistically pretty far removed from the ones that populated the arcades that we grew up in, featuring unfamiliar titles and pieced-together homemade arcade cabinets to match. Take Osama's Dead, Baby, created by Ivan Safrin, a playable version of the viral YouTube video featuring a man shooting a gun from a moving riding lawnmower, shortly after bin Laden's death. Also present at our live taping was Noah Sasso's Miracle Adventures in 2113, an unofficial sequel to the 80s Famicom title Miracle Ropit's Adventure in 2100, featuring the sort of throwback graphics that define a fair share of indie gaming titles. Tim got some serious on-screen hands-on time with Hot Throttle, a game developed by Doomlaser and Cactus, centered around a naked guy who thinks he's a car. The game was developed for Adultswim.com, after the team's original concept, which involved a lot more poop, was rejected for obvious reasons. The game, along with the rest of Babycastles' lineup prove once and for all that the arcade isn't dead, it's just naked, runs around a track, and makes lots of engine noises with its mouth.